Here is the truth about revolution, war, dictatorship and resistance. It is a simple truth and it is crushing: people suffer. In this powerful picture by Greek photojournalist Giorgos Moutafis a refugee family in Janoudia in north-western Syria wait for rebels to help them across the border into Turkey. In the bold rhetoric of our time, this might be described as a picture of defeat, an indictment of Bashar al-Assad’s crackdown on opposition to his rule, a call to arms for western democracies that are so much less eager to help in Syria now than they were in Libya a year ago. Perhaps it is all those things, and anything else politics wants it to be. But first, it is a human document. 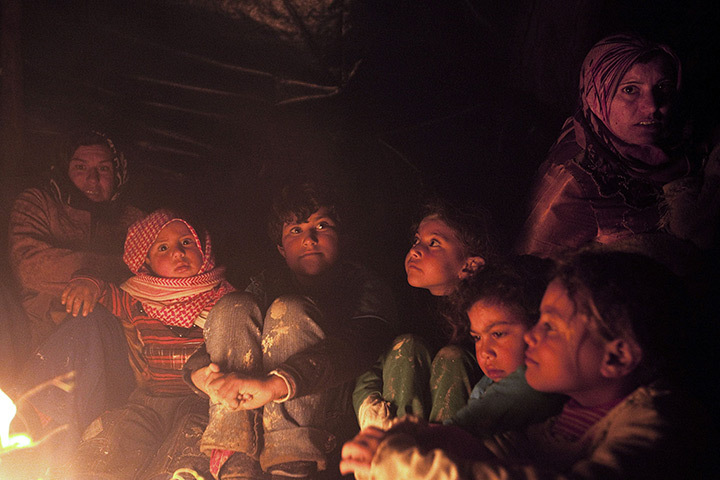 Five children sit in a pool of light amid the dark, their faces patient and resilient, their confusion and fear obvious. Each has a different expression but none are smiling. One child gazes downward while the youngest-looking boy stares at the camera. The adults in the picture, knowing more, look back at the photographer as they gather close to the children. Everyone’s eyes seem to be searching, puzzling. The glow that warms their faces reveals a moment of contemplation before the next arduous stage of a journey. Painters have known for centuries how to use nocturnal light to intensify our recognition of vulnerability. In his painting The Nativity at Night, which dates from about 1490, Geertgen tot Sint Jans shows the Madonna and child by candlelight against the dark. In this photograph, the shiny wall of the tent or canopy behind them creates a starless black night. Against this eeriness, Moutafis is able to give this family a profound dignity as the human instinct for light in the shadowed hours heightens their meditative companionship. It seems a timeless moment. After all the hopes, anger, and bloodshed, here we are again. Refugees wait to cross a border. Lives are turned upside down. When the Arab spring began last year it was hailed around the world as if it were a new fashion. It trended. The Occupy movement was equated with it as if there were no difference between protesting in democracies and rebelling against dictatorships. The demand for democracy that has swept the Arab world is profound, but how could anyone have expected this historic convulsion to be bloodless? This family bear witness that history is rarely gentle. Velvet revolutions are rare. If this powerful photograph looks as if it could have been taken decades ago, or painted by an Old Master, that is because the brutal violence of Syria’s regime has unleashed realities of suffering that recur whenever the humble routines of real life are invaded by big history. Look at this picture and thank the stars you live in a boring place.